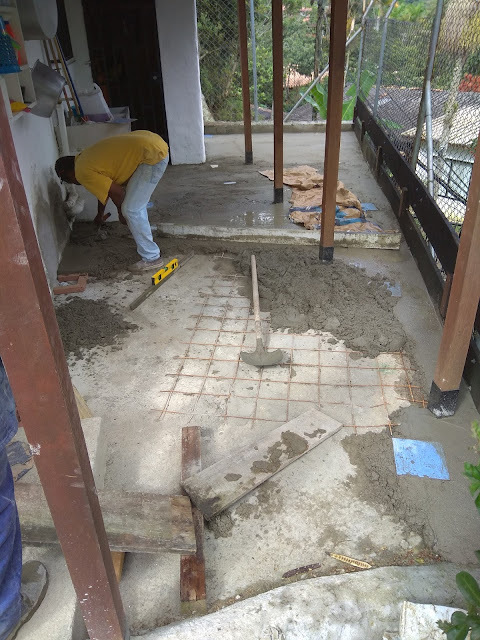 Diego turned up with another bloke, who's name I couldn't pronounce all day... and we set to work in the scorching heat, laying the new Drying area floor. The sand and cement I had bought yesterday, soon disappeared, and it was obvious I was going to need a lot more, in fact I ended up having to buy 56 sacks of sand and 9 of cement, by the time I had carted it all from the Suppliers next door, and filled up the cement mixer numerous times, my back is all but broken. 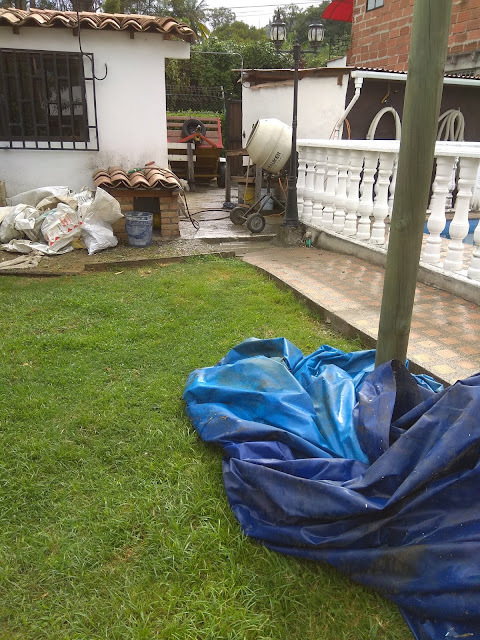 This was my work station, along with Diego's Can Lad, and yes we worked on through the storm, but I was sweating so much, I soon dried out again afterwards. In the mean time Diego was doing the cushy work, and in the dry!! Despite all the pain, we had a good laugh, and the job was finished. What did surprise me was when Diego said that Oscar, who helped him on the septic trap job, would be here at 8am to do the tiling, I replied "Next Saturday? ", he responded "No, tomorrow", I asked if that wasn't too soon, as the concrete would still be wet, but he assured me that it is the prime time to tile...Well, it is Colombia! At least I shouldn't have much to do tomorrow, as Oscar is also bringing help, I will make myself scarce, I just have to drill some drainage holes through the wood bordering the floor, I will then silicon short lengths of pipe into the holes. That is, if I can get out of bed in the morning! !